DA Form 591B or the "Rotc Supplemental Service Agreement For Special Medical Program Participants" is a Department of the Army-issued form used by and within the United States Military. The form - often incorrectly referred to as the DD form 591B - was last revised on October 1, 1985. Download an up-to-date fillable DA Form 591B down below in PDF-format or look it up on the Army Publishing Directorate website. is used to identify the individual. Sign all copies and attach one DA Form 591b to each copy of DA Form 591.
medicine, optometry, podiatry, psychology (doctorate), sanitary engineering, or social work. b. 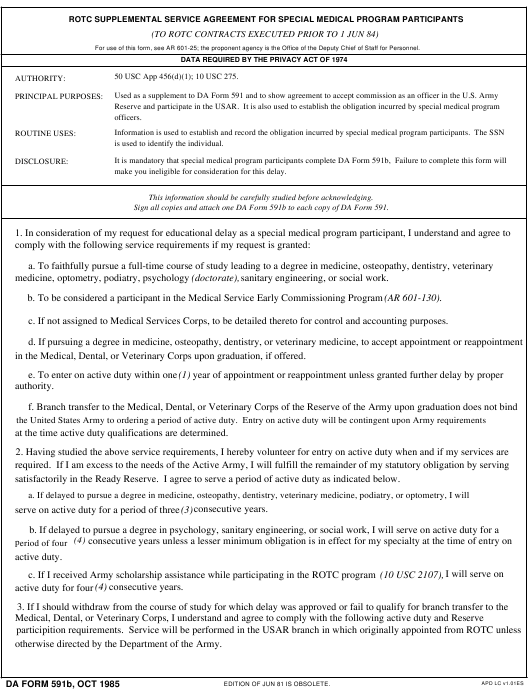 To be considered a participant in the Medical Service Early Commissioning Program (AR 601-130). c. If not assigned to Medical Services Corps, to be detailed thereto for control and accounting purposes. in the Medical, Dental, or Veterinary Corps upon graduation, if offered. at the time active duty qualifications are determined. satisfactorily in the Ready Reserve. I agree to serve a period of active duty as indicated below. serve on active duty for a period of three (3) consecutive years. active duty for four (4) consecutive years. otherwise directed by the Department of the Army. EDITION OF JUN 81 IS OBSOLETE. consecutive years of active duty and the remainder in the Ready Reserve. active duty and in the Ready Reserve equals 6 years. 4. If I am not required to serve on active duty, I agree to serve a period of from 3 to 6 months of active duty for training. my original appointment, unless sooner discharged by proper authority. until the required service is completed.